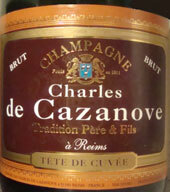 Charles de Cazanove started making Champagne in 1811 in Avize, in the "heart of the Côte des Blancs." They make about 3 million bottles of wine each year, and are now based in Reims. Most vinification takes place in stainless steel vats, although oak is also used where appropriate. I first ran across their wines at a tasting, and the Stradivarius very much impressed me and was a great deal. In fact I find them to be great deals and often superlative wines. This despite the fact that, for example in the UK, they appear to be widely available at supermarkets. Family run until the mid 1950s, they have had several owners including Martini & Rossi and the Moët – Hennessy Group, They were bought out in 2004 and are now the flagmark Champagnes of Maison Charles De Cazanove, although it is unclear if they currently have any other Champagnes! Tradition Brut - Often known as simply their Brut, this wine is 60% Pinot Noir, 30% Pinot Meunier, and 10% Chardonnay. You can sometimes find this wine as cheap as US$25 to30, and it is a deal. Interesting it says "Tete de Cuvee" on the label but it really isn't - it's their entry level wine. A tasting note of the Tradition Brut is below. Tradition 1er Cru - A step up from the Tradition Brut, from all Premier Cru grapes, and half Chardonnay/half Pinot Noir. Tradition Rose - A pinkish salmon color, and made from 15% Chardonnay, 50 % Pinot Noir and 20% Pinot Meunier with 15% still red wine added. Tradition Millesime - Their basic vintage wine, 40 % Chardonnay and 60% Pinot Noir. 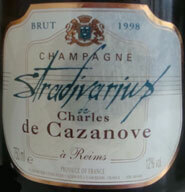 Stradivarius - 70% Chardonnay and 30% Pinot Noir vintage wine, this greatly impressed me at a recent Champagne tasting and was my first introduction to Champagne Charles de Cazanove. My friend Chuck was very familiar with this wine and a big fan. Formal tasting notes below. The nose has fresh bread dough, spicy minerality, and gingerbread. It has a very bright taste, with subtle star fruit, grapefruit, and some sweet orange peel. Some delightful golden apple as it warms. I was quite tired from travel when I tried this and have another bottle to try sometime soon when I'm not exhausted. A definite step up from the Tradition Brut above. The nose starts with cantaloupe and has minerals, sandstone, a little apple, and some white pepper like spicy minerality on the nose. The palate has melon, cantaloupe, sweet citrus peel, and is long, mouthfilling, and voluminous. Some slightly baked red apple. An incredibly friendly wine. This is all about high toned white and light colored fruits and absolutely lovely. In fact I'm sure Mrs. Howell, a.k.a. "Lovey" from Gilligan's Island would love this wine. Never had a Champagne like this before. I've already bought more. A bargain at about US$60 and below.